Christine is completing her PhD in the Animal Welfare Program at the University of British Columbia (UBC). Her research focuses on how dairy farmers and veterinarians can cooperate to improve calf welfare. Prior to coming to UBC, Christine worked with exotic and domestic animals in zoological, sanctuary, educational, and farm settings. 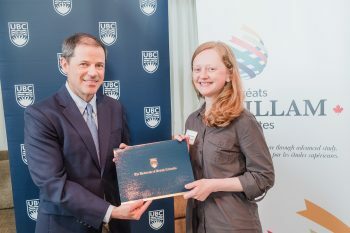 In addition, she worked internationally with smallholder livestock farmers and rural development.Christine earned her Certificate in Advanced Teaching and Learning and is an Instructional Skills Workshop facilitator with the Centre for Teaching, Learning, and Technology (CTLT) at UBC. She credits being awarded the Killam Graduate TA Award to having supportive faculty and staff in the Animal Welfare Program and the Graduate Student Programs at the CTLT.